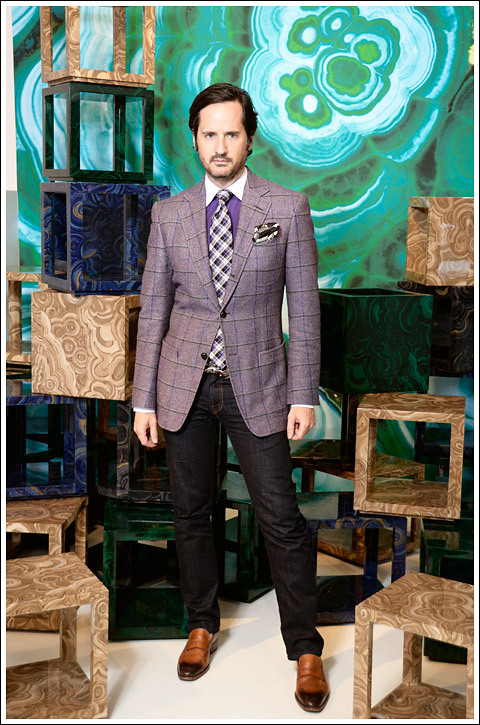 Liz O’Brien Gallery – WHAT IS JAMES WEARING? Of course, many of you have already purchased your tickets for the fabulous Winter Antiques Show – Young Collectors Night but we’re taking a tiny break from our Lyford Cay series to remind you that the date is nearly upon us! Mark your calenders for Thursday, January 31st from 7-9 PM and purchase your tickets now. There promises to be a tremendous turnout for this venerable chic-fest, and exhibitors will be going all out to bring their most marvelous pieces to showcase. I stopped by the lovely Liz O’Brien Gallery just now to see some of what they’ll be bringing. 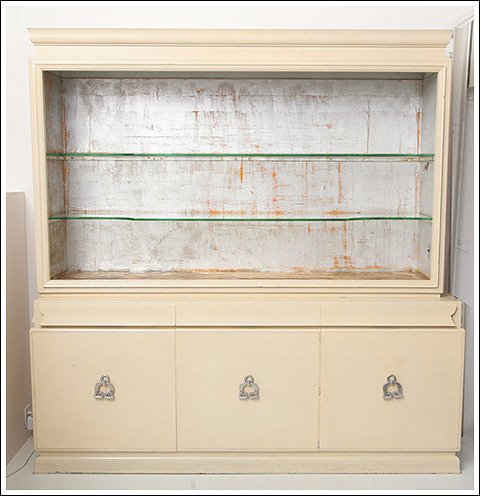 A stand out for me is this very important parchment cabinet (below) with silver leafed interior and open cut-out glass top-lit shelves by Samuel Marx, whose restrained yet luxurious aesthetic make his designs quite timeless. I could see this cabinet (filled, say, with a colorful collection of Asian porcelain), in a dining room with a modern Chinese-style wallpaper—arranged with an Alessandro Albrizzi Smoked-glass top octagonal dining table with Liz O’Brien Editions; Frances Side chairs; a Bagues rock crystal chandelier; and one of my “Groussay Grid” carpets from Doris Leslie Blau, this look is simply beyond fresh and glamorous! I look forward to seeing you all on the 31st to share ideas on how pieces like these can be used in elegant and exciting ways that feel right for today’s collector. As mentioned before, It’ll be a win win evening—not only are you guaranteed a grand time but your ticket will be helping to support the East Side House Settlement, a community resource in the South Bronx. It’ll be a fun experience that supports a good cause. 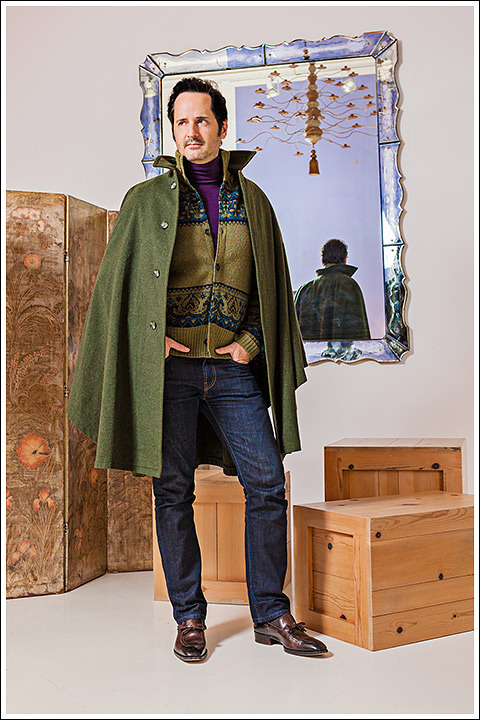 Admiring the beauty of it all at the Liz Obrien Gallery, I’m sporting a vintage Lodenfrey loden cape (feeling very Hubert de Givinchy), Michael Bastian fair isle wool cardigan, Tom Ford era Gucci purple cashmere turtleneck, J Brand Kane jeans, Tom Ford brown leather tasseled loafers, vintage Rolex watch and my fragrance is Creed Epicea. We do go on quite a bit here at WIJW about the super stylish Liz O’Brien, and it is not without good reason. She really does have one of the finest galleries here in New York City! We share her passion for the iconic masters of the 20th century, and do love the excitement, spark, and historical interest these pieces can add to a fine interior. 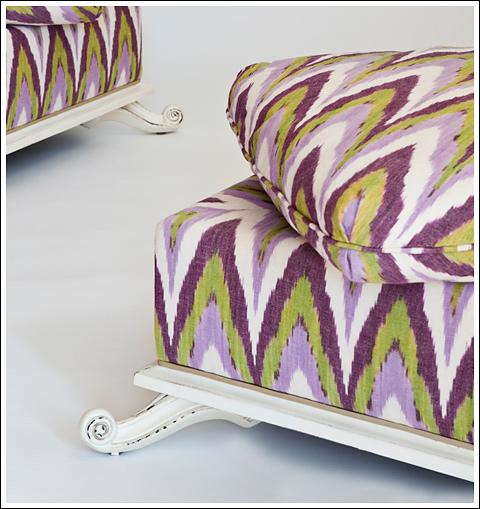 Her marvelous gallery is filled with the most fabulous assortment of sofas and chairs, upholstered in richly colored and jewel-toned fabrics that are available for immediate gratification or to be ordered and produced in one’s own fabric. 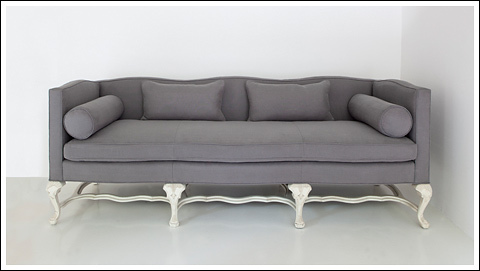 The Pamela and Jayne sofas (below) are based on models by the legendary firm Maison Jansen. The Sister Pouf was one of Sister Parish’s favorites. 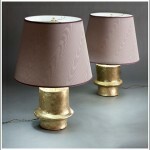 To be sure, I’ll be incorporating all of these gorgeous pieces into the interiors I’m creating for my clients. Do visit her stunning gallery to explore the full range here as well as the sublime collection of vintage pieces that O’Brien is famous for. Me and stacks of the Albert Table (below). Based on a design by Albert Hadley, it’s a chic jewel of an object that can be used as a side table or grouped in multiples, fabric wrapped with a high gloss lacquer finish. 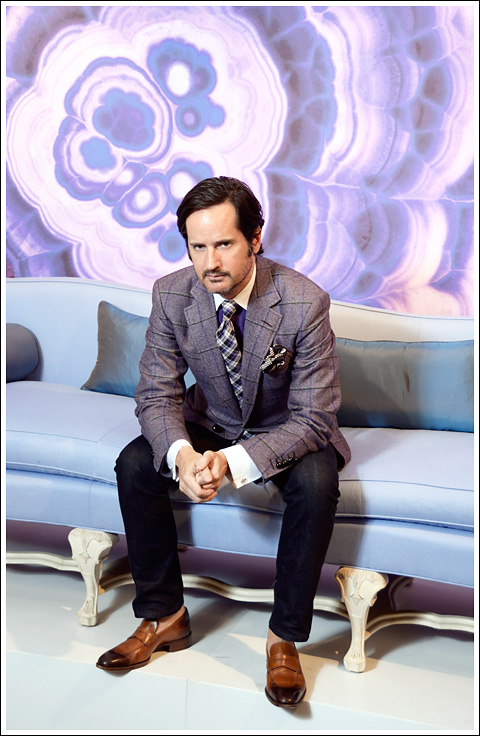 Enjoying the outrageous beauty of the Liz O’Brien Gallery, I’m sporting a Tom Ford “Country Jacket” in amethyst wool silk tri-color windowpane, glen plaid wool, cashmere tie, black and white silk pocket square and saddle leather loafers, Turnbull and Asser purple cotton shirt with white collar and cuffs, vintage moon stone cuff links, Gucci python belt with silver double horse head buckle, J Brand “Kane” jeans and my fragrance is Creed Windsor. The Liz O’Brien gallery is one of my NYC favorites. 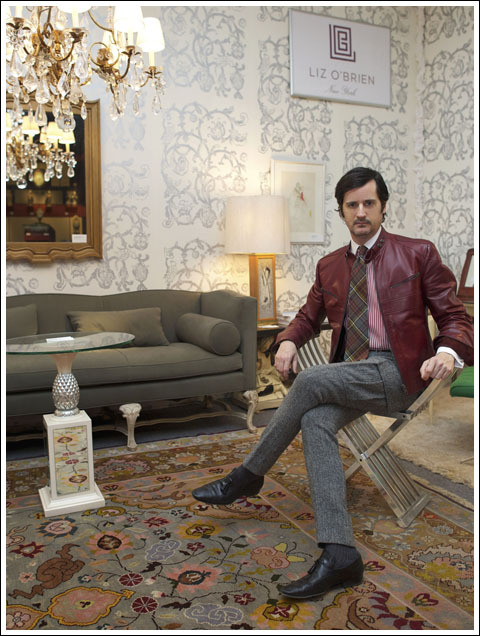 There you’ll find a truly stunning selection of pieces by legendary designers and design houses of the 20th Century like Maison Jansen, Tony Duquette, Albert Hadley, and Francis Elkins to name a few. 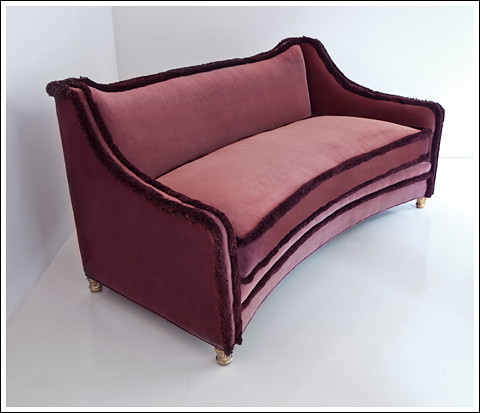 I’d be thrilled to own most any of the many pieces I find on display at her super chic gallery; O’Brien is indeed an invaluable resource for many avid collectors as well as designers like myself who have come to rely on her expertise and exquisite taste. As you have probably surmised, I share her passion for the iconic masters of the 20th century, and love the excitement, spark, and historical interest they can add to a fine interior. I was of course thrilled to visit with O”Brien while she was exhibiting at the very prestigious Winter Antiques Show, and it isn’t surprising that she had one of the most attractive displays at the show! O’Brien decorated her booth with a sophisticated Syrie Maugham wallpaper named Tree of Life (now produced by Studio Printworks) in gray, which created a gorgeous backdrop to the many rather magnificent pieces she brought with her. 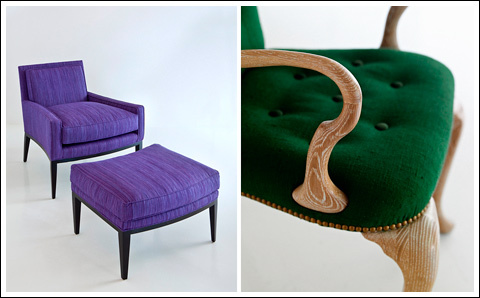 I’m particularly wild about the settee made by Maison Jansen for Lady Louis Mountbatten’s bedroom in Brook House, London, and I’m also quite taken by a pair of Italian Blackamoor tables, and the most beautiful chandelier by Baguès—together, these would make a perfect foundation for the most absolutely ravishing room! 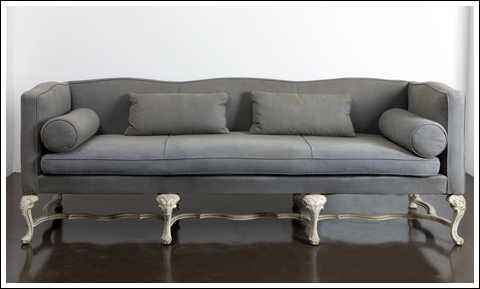 Maison Jansen scalloped-back settee—provenance, Mountbatten Residence. 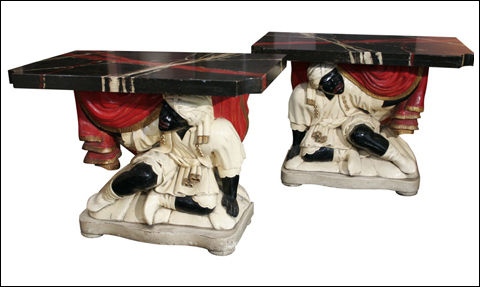 Blackamoor tables. Italian, c. 1920. 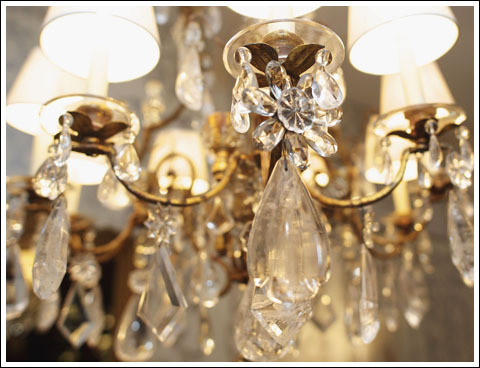 Baguès nine-light chandelier in bronze with rock crystal pendants. Taking a few moments with Liz O’Brien, I’m sporting a red leather motor cycle jacket by Gucci , red and white striped cotton shirt with contrast white collar and cuffs by Turnbull and Asser, wool tartan tie by Ralph Lauren, Seaman Schepps grey pearl cuff links, Alexander McQueen herringbone wool tweed cargo style pants, black leather wingtip tasseled loafers and black patent and silver leather belt with grommets both by Gucci, my fragrance is Creed Windsor. Photos by Justin Williams.